Today, states, counties, cities and independent agencies that prepare CAFR reports face an extensive challenge: completing an accurate, auditable, and timely CAFR while using manual processes that are inefficient, error-prone and lack strong internal controls. For many organizations, the annual CAFR reporting process usually takes months to complete, as public sector finance officials face the daunting task of preparing their organization’s financial information using spreadsheets or homegrown systems that are difficult to maintain or rely on significant IT support or outside vendors. Our new generation world class technology solution can radically transform financial reporting process, bringing efficiency, order and control to what is often regarded as a somewhat haphazard and manual process characterized by multiple stakeholders, file formats, documents, outputs, applications and a heavy reliance on personal productivity tools, like MS Office. It can provide a secure environment in which multiple participants with different roles and responsibilities across many different departments can collaborate in the controlled assembly of complex outputs and filings yet continue to work independently. Neubrain CAFR Reporting Solution is a secure, collaborative, enterprise-scalable reporting and process automation solution that enables users to merge enterprise data with focused narrative analysis in a controlled, auditable environment. It automates the collection of any and all data in a single, dynamic reporting and analysis solution. Multiple participants in different departments can collaborate in the assembly of complex reports, working independently while ensuring that proper controls and approvals are in place. The solution provides integrated tagging to use on various regulatory filings and can create extension taxonomies with pivot based navigation for easy review. Enterprise disclosure management - Combine financial data from a variety of sources, dynamically linking numbers and narrative in financial statements, annual reports, board books, regulatory reports, for internal and external reporting across any department. The solution automates the entire close-to-report process. Financial management process automation - Facilitate collaboration and communication among report contributors. Assign sections, content items, set deadlines, status and notifications and have multiple contributors work within the report at the same time while reducing bottlenecks, errors and overlap. Security, control and governance - Multiple contributors can work simultaneously on the same document or presentation with full security and governance. The solution gives you full traceability by providing audit logs and controls that capture changes, updates, revisions and every adjustment - including scaled, rounded values, and balancing adjustments, among others- so you can easily audit and trace information back to the source. Complete MS Office integration - Native integration with Word and PowerPoint, plus built-in accountability, status and workflow function. 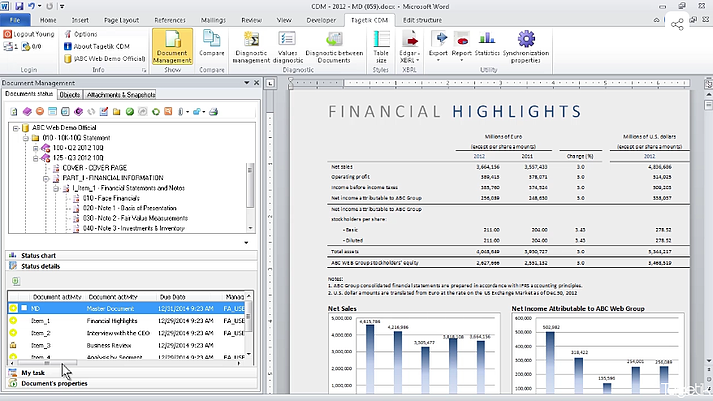 The solution automates disclosure reporting and supports multiple output formats including PDF, PPT, Excel and Word. Flexible deployment - On-Cloud or On-Premise deployment to meet your organization’s needs and preferences. Extensive XBRL support - enables creation and validation of XBRL reports for debt management, grants management or any other type of financial-based government reporting.